The NLD’s ongoing narcotics crackdown has caught many drug addicts, but health experts say they should be treated as patients, not punished. YANGON (Myanmar Now) – Several young men were standing near the entrance of Thingangyun Hospital in central Yangon on a recent July morning, waiting impatiently for a fellow drug addict to exit the facility. Soe Maung said the NLD’s approach had raised fears among Yangon’s addicts, while police were more quick to arrest recovering users who failed the conditions of the methadone therapy programme. Myanmar has long been a major producer of opium, its derivate heroin and methamphetamine, much of which originates from and passes through its poor, ethnic borderlands, where the government remains weak. 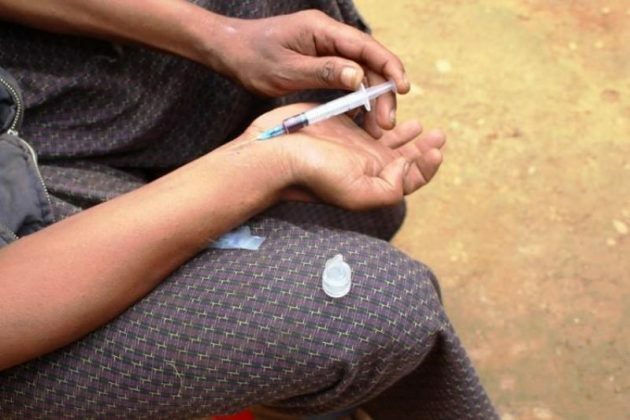 Drug abuse in these areas and in Myanmar’s major cities has reportedly worsened sharply in recent years, prompting calls for a new approach to drug addiction. Dr. Hla Htay, senior technical manager at the Burnet Institute and a member of the group, said the government’s capacity to provide methadone therapy is hindered by current laws and limited due to a lack of resources and facilities. The Thingangyun Hospital methadone service is limited to 8 a.m. to 11 a.m., another practical hindrance for addicts, who might relapse if they miss the methadone’s clinic opening hours, according to Win Min, a Burnet Institute staffer who counsels addicts. Dr. Hla Htay said drug reform advocates have worked together with police officers of the Central Committee for Drug Abuse Control (CCDAC) to draft amendments to the 1993 Narcotic Drugs and Psychotropic Substances Law, which would remove penalties for drug users. Dr. Hla Htay said he hoped the bill could be brought to the attention of the NLD government and parliament within the next few months so that it could begin reforms. *This article first appeared on Myanmar Now on 18/8/2016.